Home » Company » How Billing Audits can help you recover Lost Revenue? How Billing Audits can help you recover Lost Revenue? Healthcare billing involves a large number of people and processes as well as a high level of expertise to make it work well. Not all healthcare providers have the resources to do it efficiently. Healthcare billing audits can help you understand where you are going wrong and losing money. Billing audits often show the following. The above listed items make billing complicated. Insurance companies are like constant adversaries to the positive outcome. Audits of medical billing show that missing revenue can range from anywhere between 15% and 50%. If your in-house billing costs 5% of your revenue but you’re missing 20%, then your billing cost is actually 25% of your revenue. 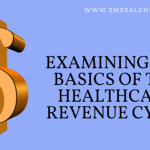 On the other hand, if you outsource your billing process to a professional service at 8% of your revenue and they can recover 100% of your revenue, your billing cost is only 8% of your revenue. Which option is better for your practice? Billing audits involve running reports and interviewing your key personnel. Assessment of your processes and contracts is important too. A comprehensive detailed audit report would include all aspects of your practice along with findings and recommendations. The insights from these audits can make your practice more efficient and productive. To learn more, call one of the best medical billing companies in Massachusetts, Emerald Health at 855-650-9906 Today! How is MACRA and MIPS Affecting Radiologists?